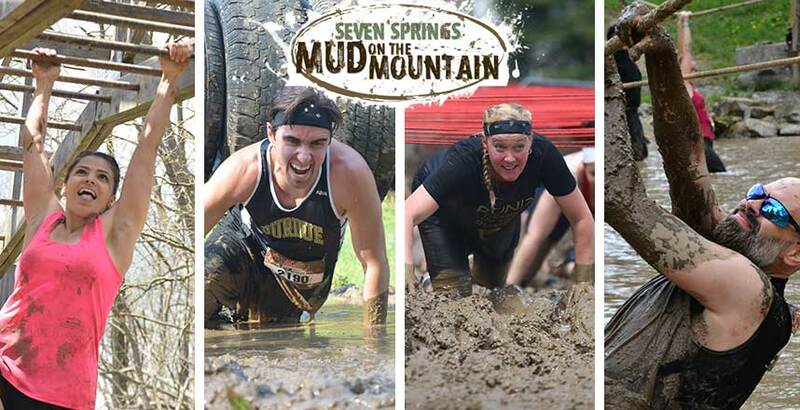 Across more than seven miles of body-breaking terrain you will traverse ponds, scale boulder fields, climb your way over obstacles and claw your way up impossible inclines, all on your way to a triumphant finish! After working to destroy your body, stick around for the Recovery Party in the Foggy Goggle, pamper yourself in the Trillium Spa and dine in one of the resort’s amazing restaurants or give sporting clays a shot for a little extra excitement! Event Registration closes Thursday, May 9, 2019 at 8 a.m., or when all spots are filled. There are heats that go out every 15 minutes beginning at 8 a.m. Sign up for the 8a.m. heat and get the fresh mud and be one of the first people to cross the finish line! A limited number of time slots are available. Be sure to register early to ensure your spot. When you register you pick the time you wish to run. People have asked about being in the same heat with their friends. We recommend registering early and together. Each participant receives a wicking shirt, medal and drink ticket for the Foggy Goggle After Party. Packet Pickup will be in the SKI LODGE on Friday, May 10 from 5-9 p.m. and Saturday, May 11 beginning at 6 a.m. Celebrate your accomplishment at the Foggy Goggle Recovery Party with your fellow Mud on the Mountain runners. Grab a drink or a bite to eat and talk about your favorite moments of the day and hit the dance floor as our DJ plays your favorite tunes! 2. Log Jam - Running over a bunch of logs sounds easy but this jaunt is uphill. 3. Needle in a Haystack - Tunnel through the pile of hay so you can learn what it feels like to be a needle lost in a haystack. 4. Mystery Obstacle - ??? 5. Pick Yourself Up - Imagine yourself climbing a giant set of steps lucky for you there are only three! 6. Giant Hurdles – Get a good jump to make it over these giant obstacles made from oak trees. 7. Treadmark - Get muddy or get treadmarked...your call. 8. Lug Nut - You might need a tire iron to get through this one. 9. Trout Line – A pond that has been filled with melting snow and 2 flimsy ropes, can there be a better obstacle? Current water temperature slightly above freezing. 10. Bicep Burner - Holding your weight in your arms, make it from one end of a set of parallel bars to the other. 11. Tired Yet - A wall that is a conglomeration of tires and wood. 12. Human Frogger - Don’t fall in the bog, frog! This obstacle will test your hopping skills and separate the bullfrogs from the tadpoles! 13. Boulder Dash – Here are your giant boulders. Be careful traversing this granite obstacle. 14. Bone Chiller - Try your best to make it through this teeth chattering obstacle without turning blue! 15. Slice of Pizza - NEW Picture climbing up and down the Leaning Tower of Pisa, But this obstacle actually looks like pizza. 16. Teeter – Welcome back to the playground except this time you can run up and down the teeter totter. 18. Speed Bump – A big giant wall of tires. Are you tired yet? You are at mile 5.5 so you have a little less than 2.5 miles left. 19. Swamp Swaggle – Down in the valley where the green grass grows you will pull or push yourself through this mud pit covered by a fence. 20. Mystery Obstacle - ??? 21. Granite Scamper - This obstacle is no walk in the park. It was created when the glaciers created the Laurel Highlands. You will travel through a bed of granite that is hundreds of yards long. 22. Pole Land – “Over and Under”. Are you tired yet? 23. Dunk Dunk Goose – probably the toughest mental challenge on the course. Going under the barrels in this spring fed lake. When you get out of the water you will feel like Einstein. 24. Mountain Mud Pit – Have you ever felt dirty?...Well you will be after this muddy chasm. 25. Toe The Line- Your chance to earn a 10 as you cross the balance beam...but only if you make it across without falling in the mud pit! 26. Clint's Hurdles with a Twist - Named after our favorite skipper. Just remember what Clint always says, ”Every pitch is a game within a game. Don't take a pitch off.” This obstacle is even higher and mightier this year! 27. Cork Screw – Finally running downhill, but you are not done yet. 28. Valley Mud Pit – Have you ever felt dirty?...Well you will be after this muddy chasm. 29. Water Cooler - A new twist on an old premise. Carry the water up the hill dump it in the new and improved slip and slide and enjoy your ride down that big padded sheet of plastic. 30. Roller Derby – You did it, get over these rollers and get your medal you are a champion today. 31. Fireman Fred – Who doesn't want to get hit with water from a fire hose? Still only talking about the weather with your co-workers? We offer the best team building experience with our Mud on the Mountain Corporate Team Program. Corporate teams will receive one additional drink ticket for the Foggy Goggle Recovery Party. Have your Corporate Team Leader call us at 814-352-7777, ext 7786 or email Penny with the following information. Number of participants. You will receive a coupon code so individual team members can register under the designated team. Only two corporate teams will be able to sign up for each designated heat time. 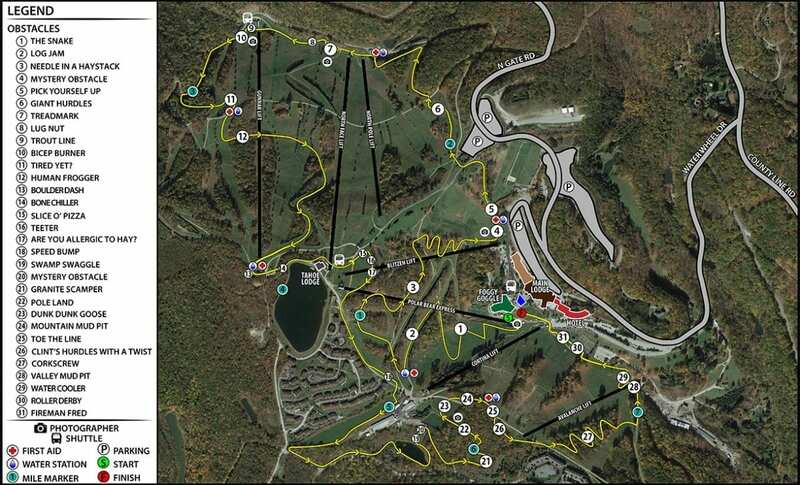 If you are ready to tackle more than seven miles and over 30 obstacles at Mud on the Mountain at Seven Springs on Saturday, May 11, 2019, then why not make it a weekend escape? This lodging package will allow you to get your rest before you take on the body-breaking terrain and the opportunity to recover in the Foggy Goggle! Starting at $149 per room, for one night or $230 per room for two nights, based on double occupancy. This package does not include event registration, chair pass or meals. Mud on the Mountain event registration closes on May 9, 2019 and there will be no onsite registration the day of the event. Hotel rates are per room, per night, based on double occupancy. Price is subject to change and availability. Advanced reservations are required. Package cannot be combined with any additional discounts, coupons offer or contracted rate. Restrictions apply. Rate does not include applicable taxes or gratuities. Additional fees apply if more that two people are sharing a room.